My thanks to Anna Lewis for asking me to guest post for I.N.K….this is one wonderful blog! So many good authors to learn from. So much to share. 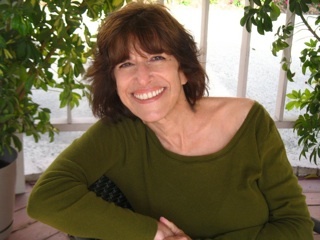 And so little time…..
(http://janefriedman.com/) talked to our local SCBWI group about how to blog effectively. Most critical, she told us, is to blog only if we could offer something useful to our readers. Jane’s advice spoke volumes to three of us: Mary Kay Carson, Brandon Marie Miller, and me. Among us, we’ve published 12 38,000-word books with Chicago Review Press Along with each we’ve developed something like 250 activities. Per Jane’s observations, we decided that our activities are “useful,” so we launched “Hands-on-Books” (http://hands-on-books.blogspot.com) in the fall of 2010. We rotate posts about our books, each one with a downloadable activity. I admit it; writing activities is complicated, and our editor at CRP, the always-gracious Jerry Pohlen, helps when I get tangled up in writing directions. 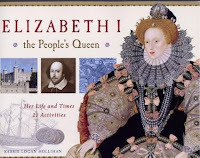 But I have to say I find great delight in taking a subject -- Queen Elizabeth I for instance -- and sitting down to brainstorm a bunch of activities to connect my middle grade readers to Tudor England. 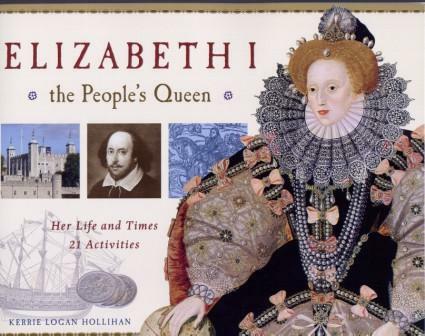 Granted, building a gibbet or teaching the art of pick pocketing wouldn’t sit well with our audience of parents and teachers, but it’s fun to think about how to show kids they can dance the pavanne, picture themselves as Tudor women or men, or set sail like the Spanish Armada with an umbrella and a skateboard. The only downside is the activities, which range from slightly silly (dress up like an ancient Greek for suffrage!) to simply wrong (cake mix does not taste as good as a cake made from scratch). 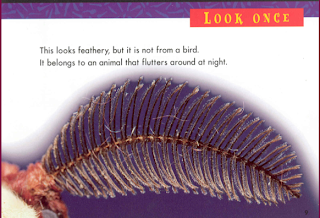 We believe that hands-on-learning enhances a child’s nonfiction reading. Some activities we write are very simple, but teachers say that even some seventh graders have trouble with directions and assembling small projects. Other activities have long lists of materials and more complex directions -- again because we know there are kids out there who want to tackle them. I’d like to hear back from I.N.K. readers what you think about activities in kids’ books. Do you use them? What’s your experience working with them in the classroom or at home? What works for you? What doesn’t? “Have you ever been in a protest march?” a student asked me last spring during an author visit. “What a great question,” I said as I scanned my brain for a reply. I love working with young people in schools, and Q&A time is perhaps my favorite part of a visit. The repartee of rapid-fire question and reply becomes a playful exercise in mental gymnastics. After a dozen years of visiting schools, I’ve heard most of the questions before. Other authors are nodding at this point. Like me they may relish the first-time questions, the ones that make you think. This question made me think. Wow, I said to myself, as my mind came up blank. Have I never been in a protest march? I marveled at that possibility. I considered January 20, 1973, the day of Richard Nixon’s second inauguration. 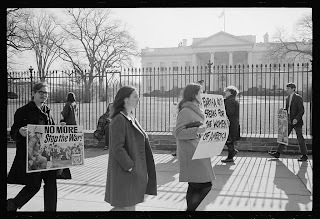 My mom was in a protest march that day, a demonstration held near the inaugural parade route expressing opposition to the Vietnam War. I had wanted to march with her, but instead I was stuck in my own silent protest. Anti-war protest, 1968. Library of Congress, LC-DIG-ppmsca-24360. My suburban D.C. boarding school observed the tradition of attending all inaugural parades no matter the students’ take on current events. Miss Keyser was a formidable presence, but I went up against our headmistress ahead of the field trip. And lost. “Everyone goes, Ann,” she said. “Everyone.” And that was that. So, at age 15, I fumed in the parade stands as Nixon rode by waving with Pat from an open car. John Lewis, Jim Zwerg, Ann Bausum in 2007. I’ve recalled that question more than once in the intervening months. Me, the persistent author about social justice issues, and I can’t recall ever participating in direct social protest. Instead I seem to live vicariously through others who did. 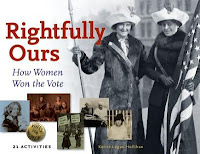 Battles for woman’s suffrage. 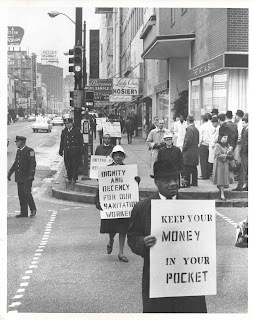 Fights from the Civil Rights Movement. Struggles to achieve free speech during wartime. Challenges faced by immigrants. The powers of investigative journalism. I’ve kept in touch with Jim Zwerg, one of the student activists featured in my 2006 book Freedom Riders. Recently Jim and I swapped our thoughts about the power of nonviolence. My interest in this force stays with me even after writing more than once about its influence on history. Memphis strike. Courtesy U. of Memphis Special Col. Even if I haven’t walked in a protest march, I’ve retraced the routes of many, from the picket marches women led to the White House during World War I, to the blacktopped ribbons traveled by Freedom Riders in 1961, to the well-worn Memphis route paced in 1968 by sanitation workers during the strike that drew Martin Luther King, Jr., toward his death. But that doesn’t mean that I should only travel the established paths of history. Now I have my antennae up. Somewhere I’ll put my feet down for a cause and add a little personal shoe leather to the health of our Republic. 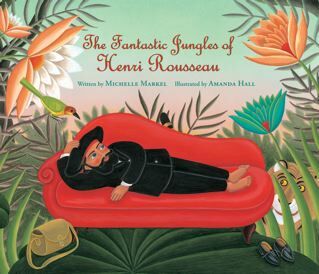 Why did you choose Henri Rousseau as your subject? What’s your connection to his art and/or his story? I chose Rousseau because of his child friendly jungle paintings and his perseverance in the face of daunting obstacles- especially the mockery of the art critics. They wrote things like “It looks like he closed his eyes and painted with his feet.” I found it incredibly moving that Rousseau could pick up his paintbrush after reading something like that. Many children get teased about their drawings, so I thought they’d relate, and be touched by Rousseau’s ultimate triumph. Of course his story resonates with grownups too, as some reviewers of the book have pointed out. Who hasn’t felt the sting of rejection? Don’t we all want to be validated? I also connected to Rousseau because both of us began to pursue our creative impulses later in life. And I have a love of French art and literature. I majored in French in both undergrad and graduate school. I viewed his paintings (most recently, “Exotic Landscape”) and read a lot of material in the original French- his letters to Apollinaire, accounts by contemporaries, those nasty reviews. The Getty Research library was a great resource. My past trips to Paris (where I lived for a few months during my Junior Year abroad) helped me visualize the setting. Why do your choose the picture book genre for your biographies? I remember it clearly- the day it all began. I took my young daughters to our local library and found Diego by Jonah Winter, mistakenly shelved with fiction. It read like a magical tale about a little boy with artistic tendencies. I didn’t realize the story was about Diego Rivera until I got to the part about the striking workers. I thought that was brilliant- to bring literary techniques and a sense of wonder to picture book biography. I’ve wanted to do the same, ever since. What do you think of the illustrations for your book? Did you see sketches? Did you have any input? I did see pencil sketches, but my input was unnecessary. Amanda did her own extensive research (which enabled her to draw portraits of Rousseau through the years, as well as likenesses of Picasso and other avant garde acquaintances). She also asked me questions through our editor. When I saw the final pictures, I was thrilled. Her paintings are emotional and luminous. It’s like the text and art are soul mates. You’ve published with big east coast publishing houses and small regional presses. How would you compare the experiences? I can’t emphasize what a pleasure it’s been to work with a small press this time. Eerdmans has a reputation for fine picture book biographies; they knew exactly what to do with this book. It started with choosing the right artist, and continued with the marketing support- making beautiful postcards, a trailer, and being responsive to every email I send them. I haven’t had this experience with other publishing houses. Henri Rousseau is about 900 words. We hear these days that fewer words are better for picture books. What do you think about this? Do you aim for a particular word count? I think children should be exposed to all kinds of writing, from short and punchy to long and leisurely. Some authors, like the genius William Steig, excel at crafting elegant leisurely passages. Children need to hear the verbal richness of books like Amos and Boris, and Sylvester and the Magic Pebble. Less is not always more. That said, I try to tell my stories in the fewest words possible, which for me is usually around 900. Once the research is done, there’s always a tension between the desire to include amusing or poignant details, and the demands of uncluttered storytelling. It’s very difficult, but rewarding work. You’ve also written biographies of artist Marc Chagall and labor organizer Clara Lemlich. How do you choose your subjects? Certain figures and historical periods capture my imagination. I also look for narratives that would resonate with children. Clara Lemlich was young, small in stature, and was treated unjustly. I think kids can picture themselves in that situation. They have a keen sense of fairness. There comes a point, while researching a potential subject, when the story just reaches in and grabs my heart. I’m overwhelmed with affection and admiration for this person. I want to express that as lyrically or joyfully as possible, as a tribute to them, and a means of inspiring young people. That’s the ideal. 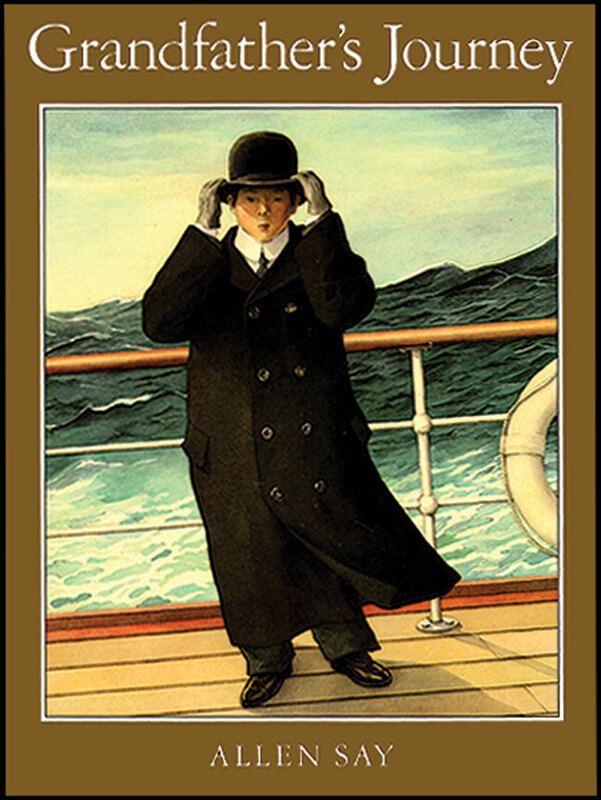 Will we see more picture book biographies from you? I have two more picture book bios in the works, with Chronicle Books. 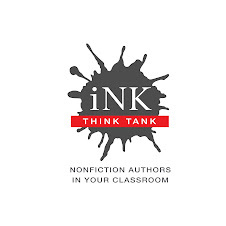 It’s a great time to be writing nonfiction! OR: What I did over my summer vacation. I was asked to teach a Reading and Writing class for students in grades 3-7. This was at a summer academy renowned for it’s college test prep for high school kids. They wanted to start a junior version of their program for upper elementary and middle school kids; in other words, grab them early. As my only teaching material I was given a typical workbook with vocabulary lists and lots of crossword puzzles and word searches to supposedly make the rote memorization of words removed from all meaningful context fun, fun, fun. Luckily I realized that no one was actually checking up on me and, thus, I could probably devise my own syllabus. I set to work, and quite a lot of work it was, to plan on using one nonfiction book for each day of class for eight weeks. Using the workbook would have been a lot easier but I just couldn’t make myself do it. So I worked quite hard to come up with an interesting group of books and worthwhile lesson plans built around each one. I certainly did not make a salary commensurate with the amount of time and effort I put in. But I did have a sense of satisfaction that I had saved these kids from a meaningless summer. At the end of the eight weeks, my tired and burnt out self believed we had all learned quite a lot from my classes. As an example of what I did, I want to talk about one of my favorite non fiction picture books: My Grandfather’s Journey by Allen Say. Even though this book won a Caldecott Medal for its illustrations, it’s the power of its few, well-chosen words that gets me every time. The vocabulary is richer than one might think at first glance. I could easily come up with a vocab list that was appropriate and meaningful to ten year olds. Examples from the text: astonished, enormous, marveled, scattered, longing. We talked about enormous for a while. Was the feeling the writer evoked much different than if he had just used the word big? We all agreed the difference was itself enormous. We also considered the author’s somewhat unusual descriptions like “the lonely seacoast.” “How can a seacoast be lonely?” I asked. There were many interesting answers to that as well. This non fiction picture book also has a plethora of themes for many more avenues of discussion: immigration, discrimination, family relationships, types of transportation and clothing, World War II, internment camps, etc. In terms of writing, we talked about writing in the first person. Some readers figure it out from the beginning, but for those who don’t it’s a joyful surprise when they understand the relationship between the writer and the story. 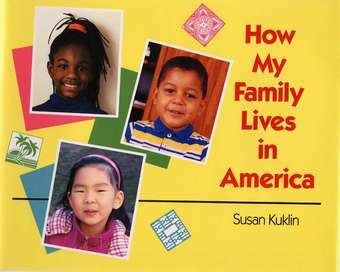 When I have tutored kids at previous times using this book, I have paired it with Susan Kuklin’s How My Family Lives in America. This book presents three kids from three different cultures describing their everyday first or second generation family life on a daily basis. I ask the students to write about their personal family life in America, specifically focusing on how they feel the mix or pull of two different cultures. It’s a theme from Say’s book that has resonated with every single kid so far. When one of the student’s parents complained to the director that the books I was reading with the kids were “too easy” I didn’t worry too much because I knew she was wrong. Some of the kids asked to read “thick books” because that’s what they were used to and identified as being at a higher level. But I stuck with my thin non fiction picture books and kept pointing out the nuances that made them more complex than they appeared by the size of their pages. In the end, I think they proved to be lean, mean excellent learning tool machines. Greetings from Lima, Peru. I’m here for a tour of three international schools (in Caracas, Lima and Santa Cruz, Bolivia). I had an experience in Caracas that I’ve had many times before in the USA and it has me thinking… and now blogging. On a screen, I showed a group of 2nd graders a page from one of my “Look Once, Look Again” books. The idea of that series is that you see a close-up photo of part of an animal (or plant) and text that hints about its identity. Then you turn the page to see the whole organism, and learn a bit about it. Here’s another one, also shown to second graders. 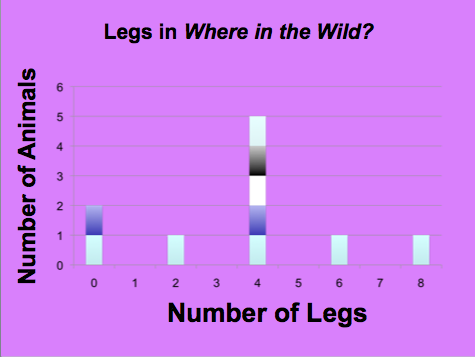 It’s a graph showing how many legs are on the various animals in my book Where In the Wild? Camouflage Creatures Concealed…and Revealed. I’m happy to say that, by and large, with a little guidance second graders everywhere can understand the basics of the graph. 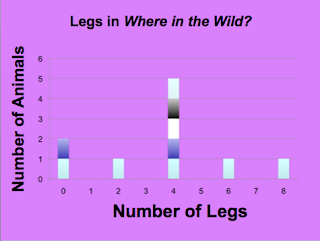 When I say, “What number of legs appears most often,” they usually answer, “Four.” My next question, “How many animals in the book have four legs?” usually generates the correct answer, “Five.” Good, they do seem to get it that you look along the “X” (horizontal) axis to see how many legs and you look on the “Y” (vertical) axis to see how many animals have that number of legs. Correct answers to other questions confirm that they get it. I do have a hunch, though. My hunch is that they fail to understand the question, not the graph. I am reminded of a professional book by Char Forsten called The Problem With Word Problems Is the Words. Great title. And so true. Students need to understand the words, deeply and fully, before they can answer word problems. And how do students get fluent in understanding words? The answer is no secret and no surprise: by reading. And especially by reading non-fiction. Complex non-fiction. The Common Core State Standards place a great emphasis on reading complex non-fiction and informational texts, reading them deeply and integrating related works on the same subject. It is estimated (though no hard data exists) that in elementary schools, children read 80% fiction and 20% non-fiction. Perhaps moving that ratio closer to 50:50, as the CCSS suggests, would help students figure out that the thing that looks feathery but is not from a bird cannot be from an owl but is, in fact, an antenna of a moth … or that no animal in Where in the Wild? (or anywhere, as far as I know) has an odd number of legs. In 2008, when I began submitting to publishers my children’s book on the Mars rovers Spirit and Opportunity, I got a number of rejections that basically said: We love the idea, love the writing, love the story, but we don’t think there will be interest in the market as the mission will be long over by the time the book comes out. Now, rejections are never fun to get, but these made me want to scream: This story is never over! This is the on-going story of our exploration of our solar system. One of my beefs with the way science is often taught in school and presented in textbooks and even in many trade nonfiction children’s books is that science is portrayed as a category of facts that kids need to learn rather than an ongoing, ever-changing set of questions people have about the world around them. That’s why I was SO pleased when my book The Mighty Mars Rovers: The incredible adventures of Spirit and Opportunity was published as part of Houghton Mifflin’s Scientists in the Field series this June, just two months before the next Mars rover Curiosity was scheduled to land on the red planet. There’s something else in the news these days that drives home the point that space exploration and science is an on-going quest. Astronaut Neil Armstrong died on August 25, 2012. The connection? Chapter one of The Mighty Mars Rovers opens on July 20, 1969, as a thirteen-year-old boy named Steve Squyres watched in wonder as the Apollo mission put people on the moon. In 1969, Neil Armstrong and Buzz Aldrin did something (walking on the moon) that ultimately inspired a young boy to dream of sending rolling geologists to Mars. Steve Squyres and hundreds of thousands of other scientists and engineers safely landed Spirit and Opportunity on the red planet for a mission so successful that it essentially answered the question: Was there enough water on Mars to support life? (Yes!) With that question solidly answered, and with everything else we learned from Spirit and Opportunity’s mission, today, the next Mars rover Curiosity can focus on searching for other building blocks of life. THIS is science. How are the missions the same? How has rover design, launch, and landing changed? What are the biggest challenges of the missions? What questions are the missions designed to answer? What tools do the rovers and scientists have to answers those questions? And maybe most importantly: What questions might come next? Discussion questions like these help students experience the connection between science books and what is happening in the field right now – and inspire readers to imagine science they may want to do – questions they might want to try to answer—when they grow up. Oh, and one more thing. All those editors who rejected my book because of timing were wrong. Not just in a philosophical sense but in a literal sense. The mission I wrote about in The Mighty Mars Rovers is not over. Defying all expectations, Opportunity, expected to last a bit over three months in the harsh, frigid Martian environment, is STILL roving the red planet, sending back photos and information about our neighboring planet more than eight years later. That little rover is like the Indiana Jones of space exploration. You, your students, and your kids can catch up on Opportunity’s most recent discoveries and see new photos sent back from Mars anytime you want. * A complete teachers’ guide to The Mighty Mars Rovers, including discussion questions and hands-on activities, can be downloaded for free here. What is this thing we call Creative Nonfiction?